Hello again. I'm Rory Chasen. I've visited Killer Characters before and I'm glad to be back--sort of. 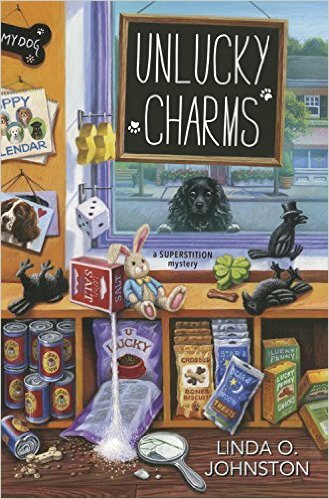 I've now been featured in three Superstition Mysteries: Lost Under A Ladder, Knock on Wood and Unlucky Charms. One thing I'm particularly aware of now is how fast this year has been going. It's almost Thanksgiving, and the December holidays like Christmas and Hanukkah are soon approaching. Now, if you recall, the Superstition Mysteries involve--what else?--superstitions. As a reminder in case you've forgotten, I personally am a superstition agnostic. I came to Destiny, California, the home of superstitions, to learn their reality when my fiancé died after walking under a ladder. I've been here ever since, along with my lucky black and white dog Pluckie. I learned that black and white dogs were lucky once I arrived, when Pluckie saved the life of Martha Jallopia, who owns the pet boutique where I now work. And... well, I've kind of become involved with another man, Police Chief Justin Halbertson. Okay. Enough of that repetition. Do you need a new home? One superstition says that, if you set up for a Thanksgiving at a house that isn't yours, you'll have your own place by the next Thanksgiving. Is your November unusually warm this year? That might presage an upcoming cold and difficult winter. Are you worried about how your turkey will come out once you cook it? If so, before sticking it into knock three times on a wooden board. That'll cause the meat to be juicy. If you happen to see a robin outside in November, open your window. If the robin flies inside, you'll have good luck. You'll have a wonderful marriage and life if you get married in November, particularly on a bleak day. Do I believe in all of those? Well, as I mentioned, I'm still a superstition agnostic. But it's fun--sometimes--to think they'll come true. I am with you - agnostic. But some I am willing to tryout. Superstition agnostic but it's fun to hear about them.